We would like to thank you for your continued support for Retinal Regenerative Medicine. With your encouragement and support, our regenerative medicine has been ongoing for more than 20 years. Recently, we conducted clinical trials and are moving forward with the field of treatment. Recently, we conducted clinical trials and are moving forward with the field of treatment. As our next step, we would like to expand the general awareness of low vision care. We also hope to expand the "isee movement" which is needed for employment support for visually impaired individuals and improvement of general awareness for them. We believe that the combination of our regenerative medicine using Induced Pluripotent Stem (iPS) cells and low vision care is the ultimate treatment for visually impaired patients. In the 2016 Rio Paralympics closing ceremony, we saw that people with disabilities were not only seen for their handicap, but also for their personalities and skills. We feel that our society has no more spaces which are filled with prejudices and misunderstanding of disabilities. Our society has been increasingly changing to an inclusive era. The road to success in life may not be simple. Each one of our goals in life are different. However, we believe that ongoing to personal goals set not by others but by ourselves are the key to each accomplish to the goals. There may get lost our ways, there may be unexpected matter happen. However, forwarding one step by step reaches you to each goals. We will open the Kobe Eye Center(tentative) in fall 2017. This facility will be the center for seamless vision care; from basic research to applied research, clinical trials, treatment, low vision care and employment support for people with visual impairments. Providing the best care to patients cannot be done alone. We hope to work toward the goal with everyone who give us their hands. We are greatly to you for your continued support and cooperation. 4-2 Methodologies how genetic testing is performed? 8-2 What is active hypometabolism? Our goal is to regenerate patients' vision. We have been making efforts to develop infrastructure around transplantation therapy of iPS*1 cell-derived tissues. We first target wet type age-related macular degeneration (AMD*3), a progressive loss of central vision from abnormal growth of blood vessels in the macula region that damages the retinal pigment epithelium (RPE*2) cell layer and then macular photoreceptor cells. In September 2014, we carried out the world's first surgical transplant of RPE cells differentiated from iPS cells derived from the recipient's own somatic cells. After the transplantation, the patient maintains the eyesight, therefore the transplanted RPE cells have prevented the progression of AMD. Also, we confirmed that the RPE cells had been safely attached to the recipient macula without tumorgenesis. In March 2017, we started transplantation of RPE cells generated from iPS cells donated by another person. 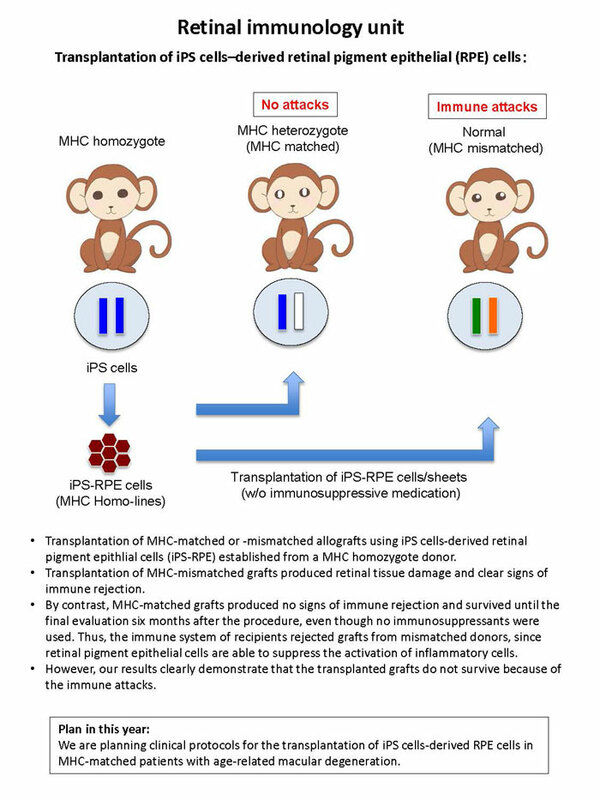 For the first transplantation surgery in 2014, we used iPS cells from the patient's somatic cells to minimize the immunorejection of grafted RPE cells, although it required much time and cost. Then we used iPS cells that have similar immunological properties to the recipients' cells, which are provided by the Center for iPS Cell Research and Application of Kyoto University (CiRA). We will operate on several AMD patients and start follow-up studies to verify the safety and efficacy. iPS cells are a type of pluripotent stem cells that can be generated from adult somatic cells by overexpressing several genes. Shinya Yamanaka first reported the technology in 2006. RPE cells are localized at the outside of the retina to nourish and protect retinal neurons. RPE cell impairment and dysfunction results in retinal degeneration and vision loss. We succeeded to generate RPE cells from iPS cells that are morphologically and physiologically similar to native RPE cells. 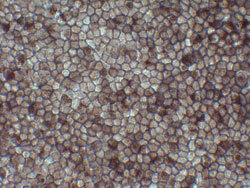 Also, the RPE cells made in our lab have no abnormalities such as tumorgenesis. AMD is a progressive loss of macular region, mainly caused by the dysfunction and damage of aged RPE cells. There are two types of AMD: wet and dry. Most Japanese AMD patients are the wet type, in which abnormal growth of choroidal blood vessels (choroidal neovascularization, CNV) damages the RPE and retina. To protect AMD patients with early onset of CNV, injection of anti-angiogenic reagents (e.g., EYLEA and Lucentis) is an effective treatment. However, in the late stage of AMD when macular RPE cells are severely damaged, the RPE cells should be replaced with fresh cells or tissue. Retinitis pigmentosa (RP) is a group of hereditary diseases caused by various genes characterized by a progressive degeneration of rod photoreceptors—--the cells that contribute to the vision in dark. 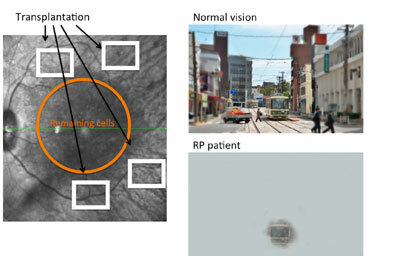 So the symptoms would be a difficulty to see in the dark, or loss of peripheral vision that subsequently lead also to the central vision in the advanced case（Image below）。Our aim is to develop a regenerative therapy by transplantation of iPS cell-derived retina (iPSC-retina) to restore a sense of light or some vision in those patients. By transplanting iPSC-retina in the surrounding area (white boxes in the image below) of remaining cone photoreceptors (orange circle), we may be able to expect to have a wider vision, or sense some more light in the dark. We could also expect some protective effect to delay the loss of remaining cells. We recently reported that by transplantation of iPSC-retina in mice models of end-stage retinal degeneration, some of the transplanted mice could sense light and light responses were recovered in the transplanted retinas electrophysiologically. We are accumulating the data using human iPSC-retina as well. In the advanced retinal degeneration, a photoreceptor layer (or outer nucleus layer, ONL) is lost. We are transplanting iPSC-retina to find we can restore the ONL structure. From left: normal retina, end stage retinal degeneration, transplanted retina. We also found that the photoreceptor cells in the graft layer can connect to host cells, transmit signals, and that the translanted mice could actually sense light while untransplanted mice could not. We also confirmed that human ES/iPS-retina can also restore ONL structure similarly after transplantation in the end stage degeneration animal models. We are also testing the function of human ES/iPS-retina to proceed for clinical application. 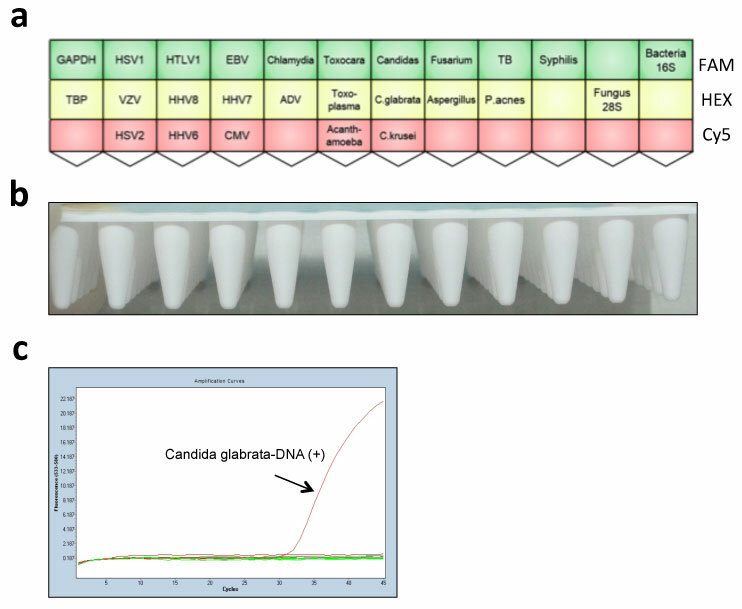 We recently established of a new comprehensive PCR strip kit (a multiplex solid-phase PCR strip kit) to diagnose infectious ocular diseases. 8 types of human herpes virus (HHV), HTLV1, Adenovirus, Mycobacterium Tuberculosis, Treponema pallidum, Propionibacterium acnes (P. acnes), bacterial 16S ribosomal DNA (rDNA), Candida spp, Candida glabrata, Candida krusei, Aspergillus spp, Fusarium, fungal 28S rDNA, Toxoplasma gondi, Toxocara canis, Chlamydia, Acanthamoeba (a total of 24 common pathogens of infectious eye diseases). A prospective multicenter clinical study would be necessary to determine its usefulness. Our team is conducting molecular/genetic diagnosis for patients with inherited retinal degenerative diseases including retinitis pigmentosa (RP). RP is the most common retinal disease which is caused by genetic change(s) and currently more than 60 genes are known to cause RP. Goals of our team are 1). To develop molecular diagnostic tests which can be used in clinical practice and 2). To establish genetic counseling systems for retinal degenerative diseases. We are willing to provide better patients’ care through achieving these goals. Additionally, we have been creating database connecting clinical findings and genetic information. Such database allows us to understand how each genetic variation can affect prognosis of diseases as well as genetic prevalence. We also plan to apply the information for development of novel therapies and personalized medicine. As described, inherited retinal degenerative diseases are associated with genetic changes. There are several inherited patterns and therefore, it is not true that all children of individuals with inherited retinal degenerative diseases are/will be affected. Indeed, a half of patients with these diseases are sporadic cases without any affected family members. Genetic diagnosis can be helpful to predict inherited patterns, but this information may give excessive impact and stress to patients and their family members. Thus, explanation about advantages and disadvantages of genetic testing and disclosure of this information have to be carefully carried out not to develop unnecessary anxiety. Genetic counselors of our team provide personalized “genetic counseling” opportunities to discuss how results of genetic testing can influence to all family members together. We hope that our genetic counseling can help patients to understand their disease better and to ease their emotional pain. Besides the transplantation studies of iPS cell-derived retinal cells, we have been studying the pathogenesis of eye diseases using model animals and retinal organoids differentiated from patient-derived iPS cells. Also, we have been exploring drugs that protect progression of the eye diseases. For the better understanding of the pathogenesis of AMD, we have been studying choroidal vasculature development, because AMD is often triggered by impairment of choriocapillaris, which is thin and tightly-packed blood vessels localized on the choroid. We recently found a knockout mouse showed choroidal hypoplasia with insufficient choriocapillaris vasculature. Also, the aged mice exhibit dry AMD-like visual impairment with shrinkage of RPE cell layer and fragmentation of photoreceptor cells. We are now studying molecular network responsible for maintenance of choriocapillaris and exploring a risk factor and a potential therapeutic target for AMD. We also use patient-derived iPS cells for disease modeling and drug screening of eye disease. We try to reproduce pathological features of eye diseases in the RPE, and neural retinas differentiated from the patient-derived iPS cells, and explore drugs that reduce the disease features. We are carrying out this project in collaboration with Kobe City Medical Center General Hospital, Institute of Biomedical Research and Innovation, Kobe University, and Tohoku University. AMD is caused by impairment of choriocapillaris, the tightly-packed vascular layer surrounding the neural retina. We found mutant mice that show insufficient choriocapillaris development, which is worth studying the pathology of AMD. In vitro-differentiated neural retinas generated from patient-derived iPScells are expected to reproduce the disease phenotype. We characterize the pathology and explore drugs that protect progress of the eye diseases. Recently we have a type of support for people with low vision who cannot use full of their visual performance because they don't know how to use it. It called "low vision care". Low vision care is a concept which represents general supports for visually impaired persons because of the ambiguous border between low vision and total blind. Conventionally this kind of support was mainly performed in social welfare facilities for visually impaired persons and it needed the physical disability certificates. However, in all these years low vision care are also conducted at ophthalmological clinics whether the patients have physical disability certificates or not. Unfortunately, the numbers of such places (welfare facility or ophthalmological clinics) is not enough to provide low vision care. Because the visual impaired person has difficulties in going out especially alone, it is very hard to reach the low vision services. Thus, for the visually impaired person, they are far from him/her even if they are in close location physically. Our project is considering the feasibility of "remote low vision care" where we link between an expert adviser at far place and an investigator who is a supporter close to a person with low vision usually. We use the video-phone application which has been commonly used along with the progress of IT devices. We think about the application of this remote care system as not only a counseling service but also daily action support. Furthermore, we set about technological development of low vision support by AI without human and investigate what kind of task AI can. Mammals posses specialized photo cells dedicated to vision called photo-receptor cells. For a long time it was a long-held belief that these photo-receptor cells are the only photosensitive cells in the eye. However, in the early 2000, a new population of photo-sensitive cells was identified. These cells express a protein called “melanopsin”, and mediate various non-visual responses. For example it has been shown that melanopsin expressing cells mediate circadian entrainment and pupillary light reflex. More recently, these cells were shown to affect sleep, mood and even cognitive abilities. We are analyzing the molecular properties of melanopsin, and have shown that its properties are unique, and differ from those of photoreceptor molecules working in vision. Molecular properties of melanopsin indicate that it is optimized for photoresponse under sustained or strong light stimulation. Visual photo-receptors are very good at detecting relative changes in light. In contrast, non-visual functions require the absolute light intensity of the environment, and melanopsin seems to be able to signal the absolute light intensity without being affected by small changes. We are further characterizing the photo-response of melanopsin and building a predictive model of melanopsin activity. The modern human life style means that we are constantly surrounded by artificial light regardless of the sun’s position. Studies are emerging suggesting that such light environment is deleterious to our health and well-being. We hope that by better understanding melanopsin’s function we can better understand these effects of light and apply our knowledge to design light environment with non-visual functions in mind. 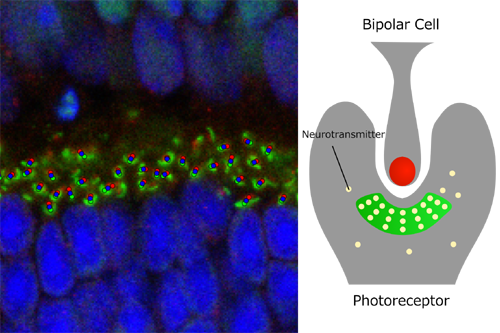 One of the goals of our lab is to restore visual functions to degenerate retinas by photoreceptor cell transplantation. Our previous work has shown that grafted cells integrate in the host degenerate eye, but efficiency remains a critical issue. For the graft to relay light information, it must connect to the host by forming synapses. Assessing synapse formation in degenerate retinas is often difficult, as non-specific signals are prominent, many synapses are not fully formed as in an adult healthy retina. We have therefore developed an objective and robust method for synapse quantification. The figure shows a schematic representation of photoreceptor cell and bipolar cell synapse, along with an immunohistological image with colored dots indicating the synapses detected by out method. 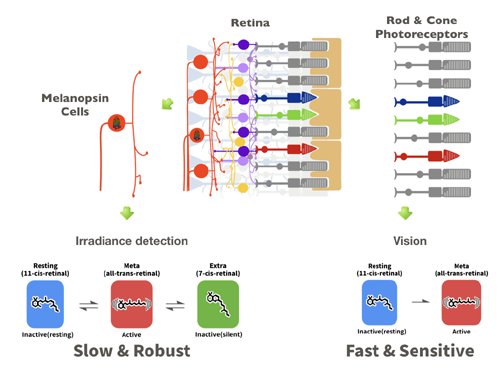 We are now applying this method to investigate the effect of light in the development of the retina. Preliminary results indicate that light may have an effect on synaptogenesis during development. The synapse formation in the developing retina resembles the synapse formation in transplanted eyes, and we are exploring ways to use light stimulation as a non-invasive stimulus to enhance synapse formation. Animals actively reduce their basal metabolic rate (BMR) during hibernation. We are investigating the mechanism of active hypometabolism to develop a novel method for tissue preservation. BMR is the minimal oxygen consumption rate to keep the vital function in mammals. Large part of the BMR is oxygen to maintain the body temperature around 37 °C. Some mammals reduce their BMR to save their energy during winter or food-shortage. This intentional reduction of metabolism to survive is called active hypometabolism. There are several modes of active hypometabolism depending on the hypometabolic length. Hibernation lasts for months while daily torpor is several hours once a day. Lowering the metabolic rate saves the energy. This may increase the survival rate during winter or starvation. On the other hand, low metabolic rate results in series of disability or suppression of vital functions, i.e. low body temperature and immobility. Keeping stem cells alive and healthy requires continuous supply of nutrition and oxygen. We are developing a method to reduce the cost of maintenance of these cell cultures by applying the mechanism of hibernation. We are expecting to lower the overall cost of cell maintenance, which we believe encourage the wide-use of regenerative medicine. Active hypometabolism may be applied to many other clinical scenes. Transporting sick patients, making the general anesthesia safer, or providing a novel drug for malignant obesity. Hibernators are difficult to breed and their genetic information is not rich. We, therefore, decided to use mouse for hypometabolism studies. As a first step, we have developed a stable protocol to induce daily torpor in mice and found that mouse torpor share a critical mechanism with hibernating animals. We aim to discover the genetical and/or metabolic network of hypometabolims in mouse. We will compare the network with those of humans and find what is missing in us for active hypometabolism. In fall 2017, we will open the Kobe Eye Center (tentative), in Port Island in Kobe Regenerative medicine is smoothly progressing. Clinical trials using iPS cells have been conducted since 2013 and in 2017, clinical triials using donor iPS cells have been successful. As our next step, we aim to go beyond basic research, applied research, clinical trials and treatment. We aim to complement regenerative medicine and aim to lead visual function improved by regenerative medicine to low vision care. We believe that the Kobe Eye Center is essential to provide information about rehabilitation and employment support to our patients. With seven floors in an 8000㎡ campus, the Kobe Eye Center will be not only for the Laboratory for Retinal Regeneration Riken Center for Developmental Biology, but also for treatment provided by the Kobe Municipal Kobe Eye Center Hospital, specialized in ophthalmology. In addition, the Kobe Eye Center will feature a vision park where specialists will provide various and the most cutting-edge information about low vision care to visitors. This is sure to become the ideal facility for vision care. The Kobe Eye Center also will facilitate relationship building between patients, their family members, other patients with vision impairments, medical professionals, social workers, educators and additional supporters. We aim to provide the safest cutting-edge treatment, educational information and training for a bright future. The Kobe Eye Center will be a fusion of academia, medicine and industries. We hope to extend innovate from the medical research to business sector for a strong foundation of progressive vision care.